The approaching holiday season is thrillingly discernible in the New York City air. As soon as the clocks turned back, that extra hour of evening blanketed darkness seemed to give way to all the signs: lighted trees, decorated department store window displays, shopping shopping shopping. Rather than rejecting the onset of darkness and cold, all the sudden I'm ready to bask in its spirit. So what its dark at 4? Lets go hole up and drink some hotty toddys! Which brings me to the best part of the holidays: the parties! And I am so excited to share with you this Chilled Whiskey Cider Punch, a must-have at your next cold-weather gathering. Lets face it- finding the right punch can be difficult. You want complex flavors that aren't too heavy, a unique taste that also goes down easily, and most importantly, to not kill yourself in the process. A host, cook, and perfecter of the dinner party spread I may be—but mixologist, I am not. Therefore, I have no interest in running around the city like a maniac with a laundry list of pre-party errands to do, burning a hole in my wallet and schedule while I go to the umpteenth liquor store in search for pumpkin liquor or Xocolatl mole bitters. Here's a few reasons why this punch packs its own at the party. 1. The ingredients are easily locatable—and you'll use them again. I'm certainly not complaining if I have leftover whiskey or a bottle of ginger beer in my kitchen; that's a drink right there! As for the cinnamon sticks, use them to vamp up a regular coffee or hot chocolate—or boil in a pot with whole cloves to act as an autumn scented "candle" and spice up your home's signature scent. 2. The drink is pretty. It's beautiful, actually. 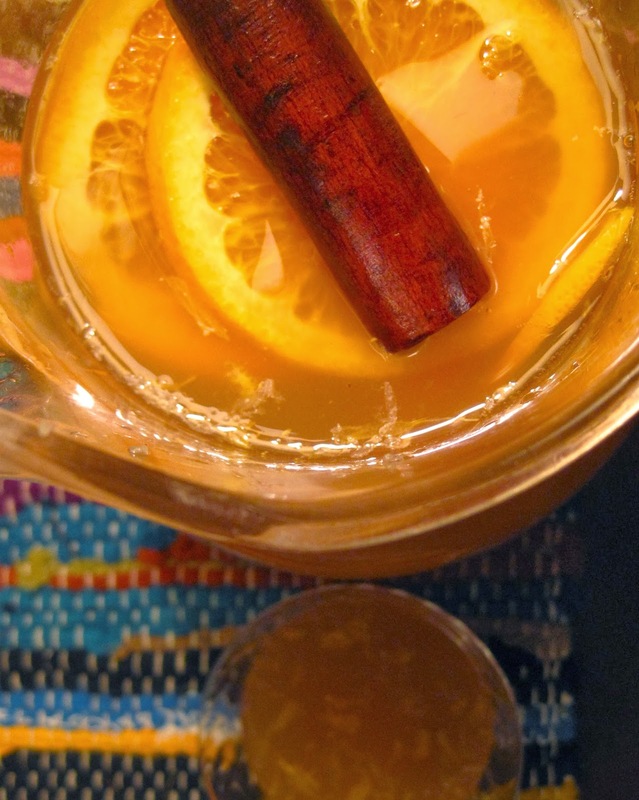 Bright orange rounds, floating amber cinnamon sticks, and an inviting warm-hued whiskey-apple tone makes this drink totally inviting. No gatorade florescence here! 3. It takes 5 minutes to make. Preparing in advance enhances the flavors, but is not a necessary step. You can throw the ingredients into the pitcher up to 2 hours before guests arrive, and then add the ginger beer prior to serving for some bubbly effervescence. 4. It's fall familiar, without overpowering. The apple and cinnamon solidly ground this drink in the autumn season, and the smoky whiskey, fresh citrus and biting ginger work to cut the sweet while delivering their own flavor intricacies. Saveur—where this delightful recipe hails from—describe it as combining "the fall flavors of mulled cider with the celebratory feel of a sparkling punch," officially checking off every possible requirement to satiate (slash inebriate) your thirsty guests. Combine the cider, whiskey, lemon juice, bitters, and ginger beer (add last) in a large punch bowl or pitcher. Stir to combine. Top with orange slices and cinnamon sticks. Ladle into ice-filled punch glasses.